Verizon is apparently on quite the policy changing mission these days. First we had news of their upgrade policy, then it was return changes, rebate removals, and now this. As of February 1st, equipment protection plans will be changing and in a good way from what we’re seeing. 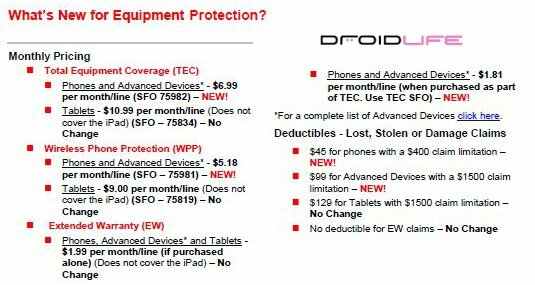 Total Equipment Coveage (TEC) will be dropping from $7.99 down to $6.99, plus Wireless Phone Protection (WPP) will now be $5.18, which is down from $6.00. Their tablet plans appear to be unchanged even with the Motorola XOOM on the way, but for those of us looking to grab a Thunderbolt, this is good news. Verizon also plans to hold an “open enrollment” of sorts for those already locked into one of these plans. A timeline for that event will be communicated at a later date.